We are excited to announce the release of our first webinar for the Empowering Youth and Families Program. Your family is probably the most important thing in your life. We believe the strength of a family is love that is bonded with communication. We believe that basic communication between family members is essential to successfully get through life’s challenges. 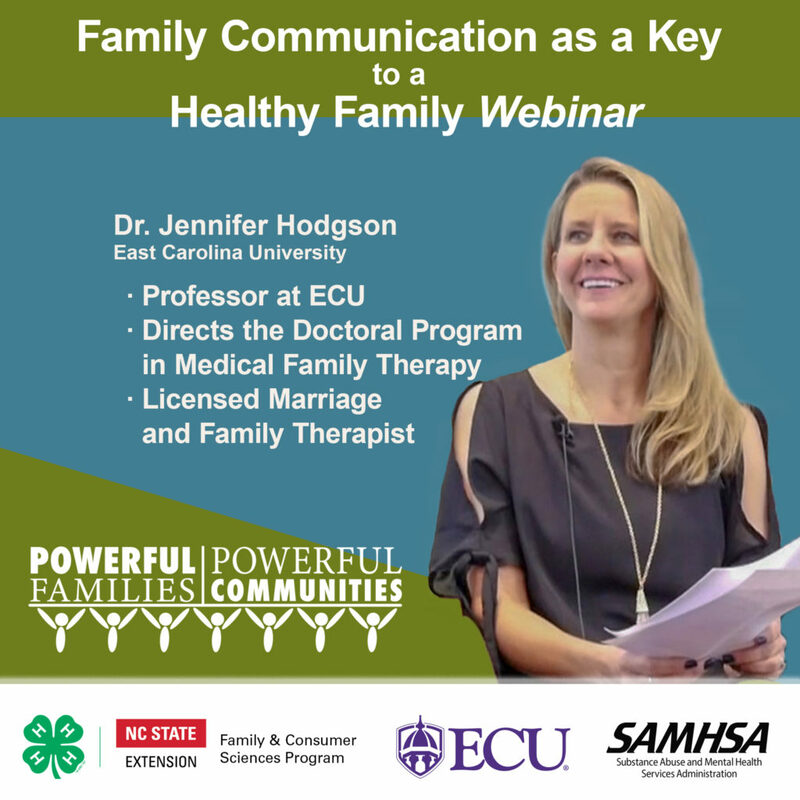 In this on-demand (no registration required) webinar, Dr. Jennifer Hodgson, a Professor at East Carolina University, discusses basic principles and strategies for effective communication. By watching we hope that you learn something that you plan to use with your family. The NC Empowering Youth and Families Program (EYFP) focuses on opioid prevention education for youth ages 10-14 and their caregivers in rural North Carolina. The goals of our program are to reduce youth substance use in rural North Carolina, to improve parenting skills of caregivers, to assist youth in making healthy choices, to improve family relationships, and to empower families to lead community change to leverage support for healthier lifestyles within those communities. On-demand video content that supports these goals will be available on our website to expand the impact of EYFP into communities around North Carolina and the US. Please visit Opioid Prevention NC or our NC 4-H Healthy Living YouTube channel to view this and future webinars. • Now Registering for 2019 4-H Summer Adventures!